Naturally produced in our bodies, ubiquinol is an active form of Coenzyme Q10 (CoQ10), which has been shown to have quite powerful antioxidant potential. Due to its involvement in ATP synthesis, CoQ10 affects the function of every cell in the body, making it important for the health of all tissues and organs. CoQ10 is a critical component of human metabolism and a dynamic nutrient that moves between two states, the oxidized ubiquinone, and the reduced ubiquinol. While in the ubiquinol state, its ability to be assimilated into the human body is increased, and it develops the additional feature of being a first class antioxidant. CoQ10 as ubinquinol also has a role as a membrane and lipid antioxidant. It works with vitamin E, lycopene and beta-carotene to prevent LDL oxidation by giving up electrons to other oxidized molecules in order to regenerate them. Since the body converts ubiquinone into ubiquinol, there is an extra step involved, and not all of the ingested ubiquinone gets converted into ubiquinol. In healthy people, over 90% of the CoQ10 in the blood is in the form of ubiquinol, but as you get older, both the total level of coenzyme Q10 and the body’s ability to turn it into ubiquinol decline. Note that this doesn’t mean that taking ubiquinone is ineffective; all it means is that taking ubiquinol is more effective. There are conditions in which adequate production of CoQ10 in the body is impaired, and in such situations supplementation with CoQ10 has been shown to be very beneficial. Declines in ubiquinol result in less cellular energy and diminished protection against oxidative stress. This produces free radicals that can damage proteins, fats and DNA, allowing degenerative diseases to get started. CoQ10 is usually ingested through foods (especially fish and meats) and produced by our bodies, although many people are unable to make Coenzyme Q10 well due to the highly complicated biochemical process required for its production. Although it is naturally in all cells, CoQ10 is particularly concentrated in tissues having high energy requirements like the heart, liver, lungs, and muscles of the skeleton. Smaller amounts are centered in the brain, kidneys, and intestines, and the rest is in general circulation for use as needed. The adult body pool of CoQ10 is estimated to be about 2g and requires a replacement of approximately 0.5 g/day based on its average turnover rate of four days. CoQ10 form the diet or supplements is absorbed from the small intestines, then passes into the lymphatics, and finally to the blood and tissues. Within each cell, at least half the amount is centered in the mitochondria, the furnace of the cells where food is turned into energy, and this is where the final stages of its synthesis occur. Why is Ubiquinol Superior to Ubiquinone? Ubiquinone is the oxidized form of CoQ10 and is the more common form of commercially available CoQ10. Ubiquinol is more “hydrophilic” (readily absorbable or dissolvable in water) than ubiquinone, and thus much easier to assimilate. The recent development of a stabilized dose of ubiquinol in supplement form is viewed by scientists as an exciting development because of its ease of absorption. This form of CoQ10 is the antioxidant form which neutralizes free radicals and decreases cellular damage. Since the body converts Ubiquinone into Ubiquinol, there is an extra step involved, and not all of the ingested Ubiquinone gets converted into Ubiquinol. Scientists have found that Ubiquinol, dramatically improves absorption of CoQ10 in patients with severe heart failure compared to supplements of Ubiquinone. Ubiquinol is a stronger protector against LDL cholesterol oxidation than ubiquinone by influencing gene expression and being a powerful antioxidant. Ubiquinol is a powerful antioxidant in the mitochondria, lipid membranes and plasma lipoproteins, and is regenerator of other lipid soluble antioxidants (Vitamin E) as well as ubiquinone and Vitamin C.
Ubiquinol is more efficient in inhibiting LDL oxidation than either lycopene, betacarotene or vitamin E.
The Ubiquinol form of CoQ10 has been recently approved by the Therapeutic Goods Administration (TGA) for use and sale in Australia. BioCeuticals Ubiquinol BioActive range supports healthy energy synthesis and markedly slows the rate of LDL per oxidation, providing strong protection against free radicals. 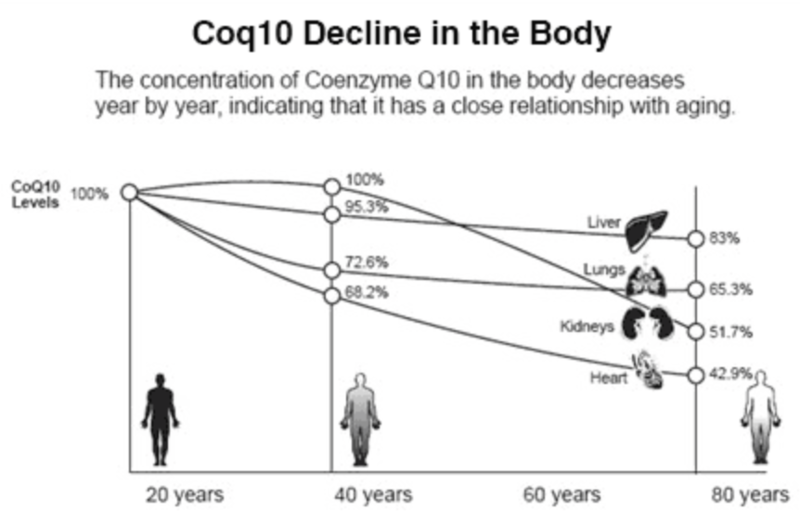 Coenzyme Q10: A fountain of youth?